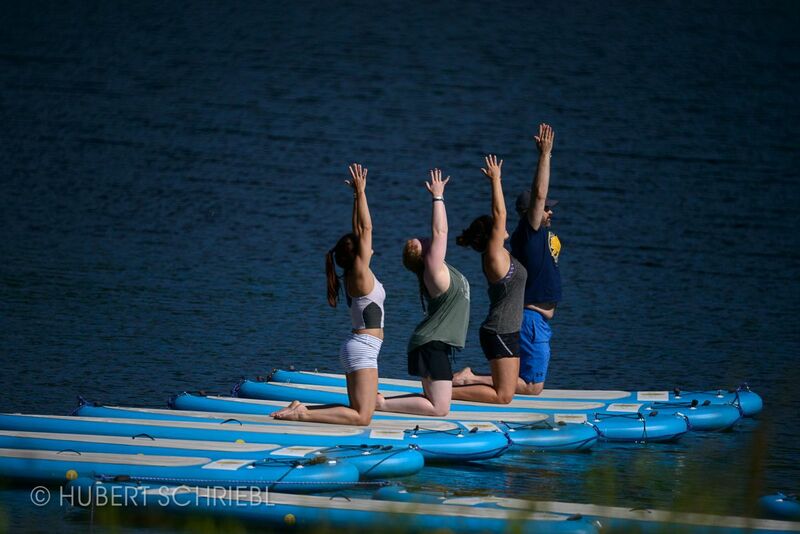 Stratton Mountain Resort offers a wide range of wellness activities including, H2Yoga atop a stand-up paddleboard. Photo by Hubert Schriebl. While the serenity of Vermont can be felt as soon as visitors cross state lines, Vermont’s resorts have taken extra care to ensure that they arrive to a relaxing environment and leave it feeling refreshed. From maple body scrubs and deep tissue massage to mountain top yoga or a walk through the woods with a naturalist, Vermont’s resorts offer endless opportunities for rejuvenation. Restore mind and body and connect with nature through organic products and unique seasonal treatments that capture the essence of Vermont. The Spa at the Woodstock Inn & Resort boasts a 10,000 square foot, LEED-certified facility featuring 10 treatment rooms, a spa boutique and locally sourced products. Embrace comfort and tranquility with natural light, fresh native flora and Vermont-inspired treatments reflecting the changing season. The Sugarbush Health and Recreation Center is a fully-appointed year-round health and fitness facility offering indoor and outdoor pools and hot tubs, a fitness center, indoor and outdoor tennis courts, squash, racquetball, rock gym, sauna and more. Massages are offered by appointment including Deep Tissue, Swedish, Relaxation, Reiki, Hot Stone, and Sports Recovery. The SHaRC also boasts a robust fitness class calendar with classes including yoga, spin, cardio, and much more. Nearby, massage therapy and yoga options include Mad River Massage, Mad River Yoga and more. 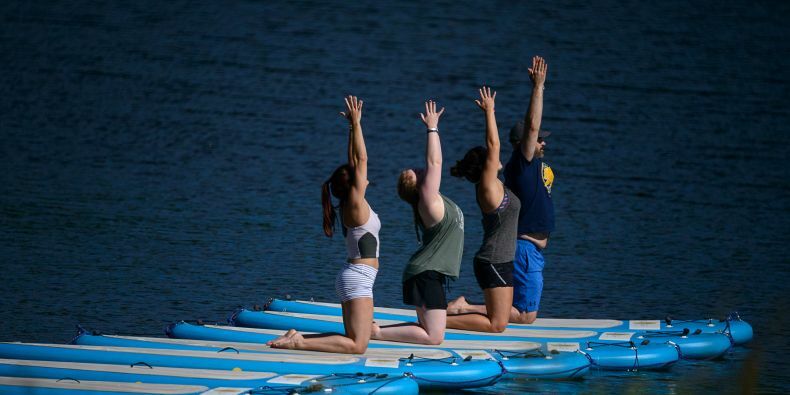 Yoga practice moves from studio to the mountain with summit classes set on a yoga deck that looks out to the Green and White Mountains beyond, as well as a Vinyasa flow in the fresh air that begins with a hike to mid-mountain. Then there’s H2Yoga atop a stand-up paddleboard. Yoga classes, as well as cycling, pilates, personal training and sports massage are available year-round at the Stratton Training and Fitness Center which also features an indoor saltwater pool, sauna and the latest weight and cardio equipment, including a Peloton bike. The Stratton Day Spa in the Village offers a full menu of massages, body and holistic treatments. Inside the Spa at Stowe Mountain Lodge guests enjoy truly being able to relax, letting go of the outside world and leave behind their daily responsibilities. Turning their cell phones off and living in the moment. To really take in what is happening and enjoying every minute of it as we allow ourselves the freedom of not worrying about everything else in our lives. Focusing on ourselves and what we need so we can truly relax. For some that comes with the touch of a massage or facial, for others it’s a yoga session, laps in the pool, or relaxing in the hot tub or sauna. Health and wellness offerings at Smugglers’ Notch Resort deliver relaxation and fitness. Classes include a meditation class that introduces techniques to encourage stress release, yoga for all levels, plus a class focusing on poses to ease stiffness for older adults. In addition to returning favorites like the Wild Edible and Medicinal Herb Walk, an herbalist from Vermont’s Horsetail Herbs hosts four new classes in natural aromatherapy, skincare, food flavorings, and health preparations. These workshops include in-class creation of personalized products and take-home how-to's. Okemo’s source for relaxation and rejuvenation is The Spring House, a two-level, 18,000-square-foot fitness and aquatic center featuring a sauna, hot tub and swimming pools equipped to accommodate family water fun and designated times for swimming laps. The Studio offers Zumba, Yoga and Total Body Fitness classes. There is a fully equipped fitness room and even a racquetball court. Spa services including Swedish and deep tissue massage or hot stone therapy are available. Also popular are facials and body scrubs including a unique maple and brown sugar foaming scrub that leaves skin glowing with a relaxing scent reminiscent of a Vermont sugarhouse in spring. Yoga, trail running, massage, meditation classes, exercise classes. Whether visitors need quiet time to unwind or want to revitalize sore and tired muscles, Trapp Family Lodge Fitness Center will exceed all wellness needs. Relax and rejuvenate with yoga, meditation and exercise classes, or choose from a variety of massage services. Visitors looking for a healthy way to spend their summer evenings can participate in the Trapp Family Lodge’s weekly Summer Trails Series and enjoy a 5k run on their beautifully maintained trails. The Killington Grand Spa features a full menu of services, including massages, facials, nail services and body treatments. Guests may also enjoy a fully equipped fitness center, sauna and steam room. Specialties include several custom signature treatments - after all, what's a visit to Vermont without maple sugar? Mountain Top Inn and Resort’s exclusive spa offers an overnight package which will relax and rejuvenate you – mind, body and soul. From the moment you arrive and gaze out at the spectacular view of mountains and lake until you settle in to your luxurious room and venture to the tranquil, rustic-luxe spa you will have found serenity. The serenity spa package includes two nights accommodations for two adults, full country breakfast both mornings, $100 per person spa credit and all of the resort stay inclusive amenities including a private beach, lake, kayaks, canoes, paddle boards, a sauna, hot tub, heated pool, tennis and more. If you’re looking for wellness, just visit Jay Peak in the summer. Everything else will fall into place.